You've finally achieved your dreams of owning a small business -- only to find that you're working nonstop and exhausted all the time. Stress naturally comes with the responsibilities of entrepreneurship, so managing stress levels is something you have to catch on to quickly if you want to avoid burnout. Lowering daily stress levels makes your work schedule more efficient, and personal life far more pleasant. Get started with these five simple ways to reduce stress in your day. 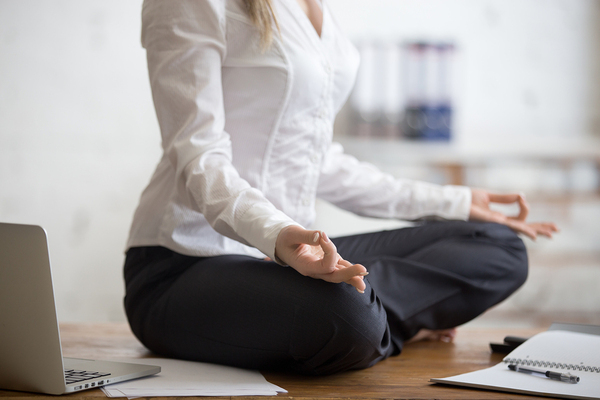 It is possible to find your zen as a small business owner. One of the traps small business owners fall into is feeling as though they have to handle every aspect of company administration -- no matter how big or small. Even if you are your only employee, there are ways to streamline common tasks, like your day-to-day business banking, to lift the weight off of your shoulders. Set up your accounts for auto-paying bills, and try to handle as much of your banking needs online -- your time is precious, and traveling to a bank branch isn't time best spent. If you're always getting sick or feeling worn down, you won't be nearly as productive or happy with your work. That's why eating well and exercising regularly is important. Even just getting out and walking can be beneficial to your health, so when you're feeling stressed, put down the sugar and try some exercise instead. It might feel like your to-do pile is constantly growing, but you won't get through it any faster if you're pulling out your hair. Instead, have set periods in your schedule that are for taking a break -- and make yourself adhere to them. Studies have shown that productivity levels are down, as are, unsurprisingly, worker breaks, while work hours increase. As a small business owner, you are responsible for setting the office culture, whether you have one employee or fifty, so prioritize stepping away at regular intervals. This goes for vacations and days off, too. Just one day spent at a spa or relaxing at the beach can get your mind and body refreshed to hit the ground running. Home offices are convenient, but they can also be hard to disconnect from. While many small business owners work from home offices, it's important to separate your work space from your live space; stay out of your office during "off hours." At the same time, if you find that you are living in your away-from-home office, you may want to consider setting up a space at home that allows you to break up your time. The key is to allow yourself to mentally separate your work life from your personal life, so that you can reap the benefits that relaxation will have on your mental state. If you're always staring at an endless to-do list, you'll feel that overwhelm before tackling each day. Instead, prioritize your tasks on a daily basis; if you find the same thing keeps getting pushed back, maybe it's something to remove from your list altogether. While you'll likely be focused on the future of your business, it's even more important to remember to approach each day in a manageable way. If you're feeling overwhelmed as a small business owner, it may be time to increase investments elsewhere to help support your efforts. Contact us today to learn more about our business lending solutions.